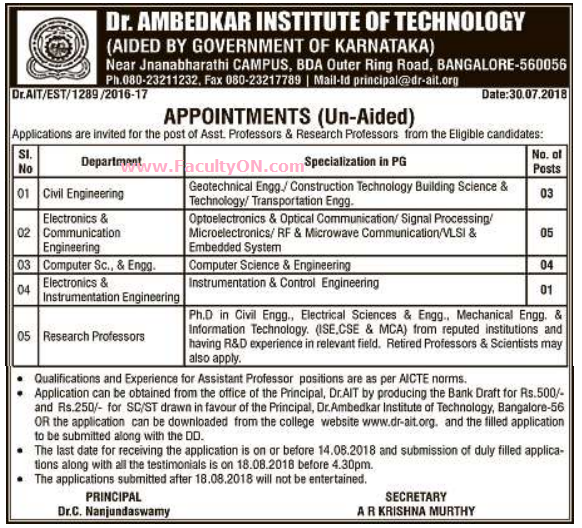 Dr.Ambedkar Institute of Technology, Bangalore has advertised in the DECCAN HERALD newspaper for recruitment of Teaching Faculty- Assistant Professor / Research Professor jobs vacancies. Interested and eligible job aspirants are requested to apply on or before 18th August 2018. Check out further more details below. College Profile: Dr. Ambedkar Institute of Technology (Dr AIT) was established in the year 1980 by Panchajanya Vidyapheeta Welfare Trust (PVPWT) Bangalore. PVPWT is founded by Late Sri. M. H. Jayaprakash Narayan. The Institution was started with Three AICTE approved undergraduate (UG) programmes in Departments of Civil Engineering, Mechanical Engineering and Electrical and Electronics Engineering (EEE). Later UG programmes in Electronics and Communication Engineering, Industrial Engineering and Management, Instrumentation Technology, Computer Science and Engineering, Telecommunication Engineering, Information Science and Engineering and Medical Electronics, were also inducted. Application Fee: DD of Rs. 500/- from General category and Rs.250/- for SC/ST category in favour of The Principal, Dr. Ambedkar Institute of Technology, Bangalore-56. Application can also be purchased directly in the college. Note: 18th August 2018 is the last date. The date 14th August 2018 given in advt is for last date of purchasing the application form only.